The house was built c. 1908 for Adolph B. Loveman, a Hungarian immigrant who in 1887 founded the dry goods business that evolved into one of Birmingham’s signature retail establishments, Loveman, Joseph & Loeb. Its English-style neighbor to the north on the Circle was built at the same time for Adolph’s eldest son Joseph. A fine example of early 20th-century Neoclassicism, the simple block of the house is made monumental by the richly detailed and pedimented portico with its clustered Corinthian columns and detail moldings. Although the identity of the architect is obscure, it is attributed to the firm of Wheelock, Joy and Wheelock. It is thought to have been at least partially designed by Thomas U. Walter III, grandson of U.S. Capitol architect Thomas Ustick Walter. Facing incipient blindness, Mr. Walter retired from the profession about 1905 and his designs were fulfilled by other firms. Back on the market in the early 1980s, attorney David Shelby for use as an office purchased it for himself and his law partner Robert Roden. Shelby restored the house retaining original materials and features, creating minimal changes to the interior arrangements and completely refurbishing the exterior. In 2008 Roden purchased the house and again refurbished the office as well as the Carriage House at the rear of the property. 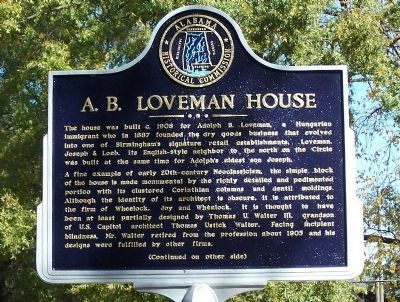 The former carriage house had been a secondary residence for the family of A. G. Gaston (1892-1996), a pioneering African-American businessman, whose mother worked as a cook for the Loveman family. The A. 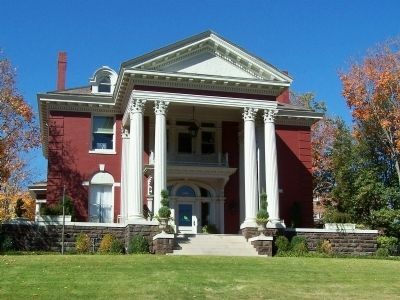 B. Loveman House was included as a part of the Highland Avenue-Rhodes Park Historic District in the national Register of Historic Places in 1977 and expanded in 1982. Location. 33° 30.464′ N, 86° 46.944′ W. Marker is in Birmingham, Alabama, in Jefferson County. Marker is on Rhodes Circle, on the right when traveling west. Touch for map. Marker is at or near this postal address: 2956 Rhodes Circle, Birmingham AL 35205, United States of America. Touch for directions. (approx. 0.2 miles away); Site of the First Alabama - Auburn Football Game (approx. 0.3 miles away); St. Vincent’s Hospital (approx. 0.4 miles away); The Little Theater Clark Memorial Theatre Virginia Samford Theatre (approx. 0.4 miles away); Redmont Park Historic District (approx. 0.6 miles away). Touch for a list and map of all markers in Birmingham. More. Search the internet for A.B. 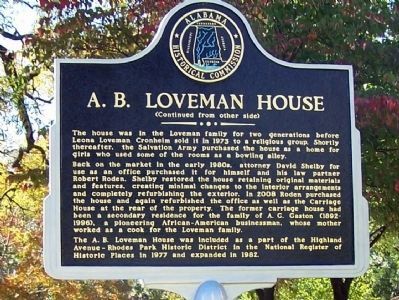 Loveman House. Credits. This page was last revised on June 16, 2016. This page originally submitted on November 5, 2011, by David J Gaines of Pinson, Alabama. This page has been viewed 739 times since then and 10 times this year. Last updated on May 28, 2015, by J. Makali Bruton of Querétaro, Mexico. Photos: 1, 2, 3. submitted on November 5, 2011, by David J Gaines of Pinson, Alabama. • Bill Pfingsten was the editor who published this page.